CEMS Convention + Expo 2019 Exhibitor Kit for extra tables, chairs, etc. During registration you will be able to request Premium or Standard booths based on location and the price paid. Requests will be honored in order received if possible. Payment by credit card is required at the time of request. 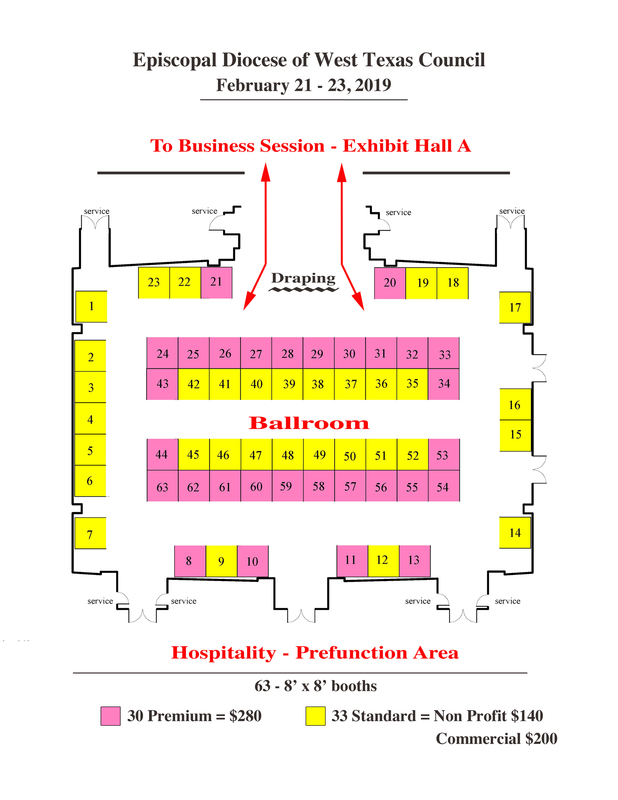 The exhibitor area will be located in the Ballroom of the McAllen Convention Center (MCC). As a valued exhibitor, we will do everything possible to make this a successful endeavor for you. The hospitality area will be nearby, drawing attendees through the exhibit area. The exhibit area will contain 63 booths, 30 of which are premium booths at $280 each. The remaining booths will be available at $200 for commercial vendors and $140 for non-profit charitable endeavors. (See map below for layout.) Booths will be assigned on a first-come, first-served basis. You will have the opportunity to request your preferred location during registration. Each booth will be a standard 8′ by 8′ draped exhibit booth. The background drape measures 8’ high, and the side drapery 3’ high. Each booth will be equipped with one 6′ draped table and two chairs. A standard single line booth identification sign will be provided. Charges for additional tables, chairs and other equipment will be addressed in the Convention and Expo Management Services, LLC (CEMS) exhibitor packet available on our website in January. The CEMS representative is Mario A. Rodriguez. Mr. Rodriguez contact information: office (956) 702-4926; cell (956) 605-2220; or mrod@conventionandexpo.net. Electricity will be available through the McAllen Convention Center. See the website for details. Our registration system has payment options including Visa, Mastercard, Discover, American Express and e-checks. Upon receipt of your registration request and credit card information, your registration will be confirmed by e-mail. When all booth spaces have been reserved, a waiting list will be maintained. Invitation to Exhibit 2019 Letter Click for a PDF copy or view below (when available). Scribd.com is a website allowing free storage of documents. Use their command buttons to Download the full packet and print. Check back often for more information. Or signup for the Council 2019 blog “Entries” RSS feed and be notified when changes are made to this website.